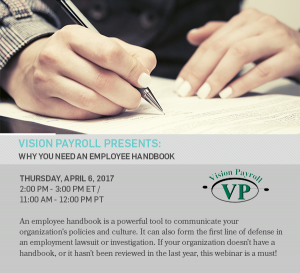 An employee handbook is a powerful tool to communicate your organization’s policies and culture. It can also form the first line of defense in an employment lawsuit or investigation. If your organization doesn’t have a handbook, or it hasn’t been reviewed in the last year, this webinar is a must! For payrolls dated November 23, including those normally paid on Thursdays, ACH withdrawals from clients’ accounts will occur on Tuesday, November 22. 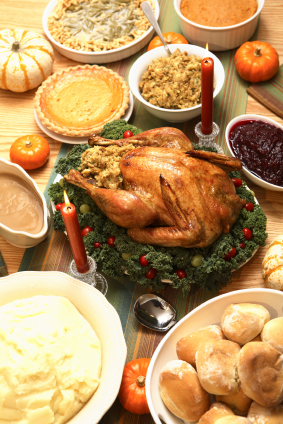 For payrolls dated November 25, ACH withdrawals from clients’ accounts will occur on Wednesday, November 23. This is necessary to ensure timely crediting of employees’ accounts on the proper day. There will be UPS ground delivery on November 25, BUT we strongly recommend submitting payrolls during this time as early as practicable. The next federal holiday will be Monday, December 26, 2016, Observation of Christmas Day. Contact Vision Payroll as soon as possible to make changes to or for questions on your processing schedule. Many taxpayers who made their next-day employment tax deposits on Tuesday, May 31, or semi-weekly employment tax deposits on Thursday, June 2, 2016, were incorrectly sent notices that their deposits were late. Due to a programming error, IRS systems did not recognize changes in deposit due dates created by the Memorial Day holiday observed on May 30, 2016. As a result of the holiday observance, the next-day deposits that would have been due on Monday, May 30, were instead due on Tuesday, May 31, and the semi-weekly deposits that would have been due on Wednesday, June 1, 2016, were instead due on Thursday, June 2, 2016. We apologize for any inconvenience, and no taxpayer action is required. IRS systems have been corrected and impacted taxpayer accounts will be updated. 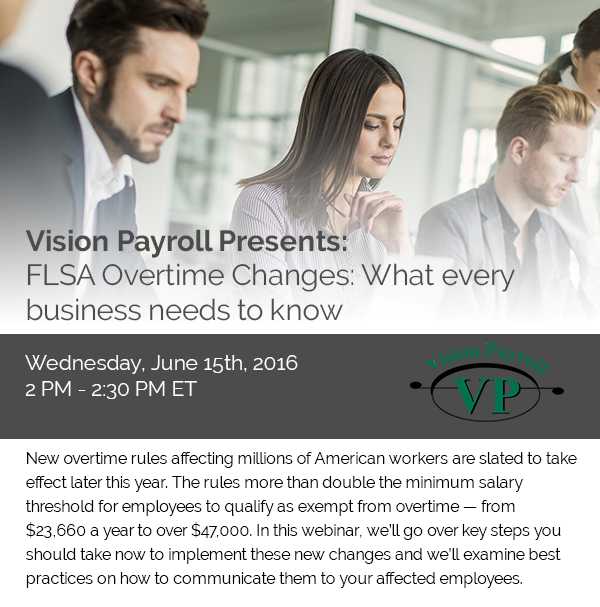 If you have any questions on a notice you received, please contact Vision Payroll. New overtime rules affecting millions of American workers are slated to take effect later this year. The rules more than double the minimum salary threshold for employees to qualify as exempt from overtime – from $23,660 a year to over $47,000. In this webinar, we’ll go over key steps you should take now to implement these new changes and we’ll examine best practices on how to communicate them to your affected employees. Please join us for this webinar. Register here! Here is important information regarding notices for Failure to Deposit penalties which may have been sent in error. Please share with your clients as appropriate. Some monthly and daily deposits of payroll taxes are being treated as late in error. Due to the observed holiday on April 15, 2016, (Washington DC Emancipation Day), deposits were not due until April 18, 2016. IRS recently identified a programming error causing deposits made after April 15, 2016, to be considered late, even though they were made timely by April 18, 2016. In some instances, taxpayers were assessed failure to deposit penalties as a result. IRS is working to resolve the issue and correct the erroneous penalty assessments in the near future. No taxpayer action is required at this time. Those affected will receive correspondence when the issue is resolved. We apologize for any inconvenience this may cause. The notice in question, is generally titled, Your Federal Tax Deposit wasn’t submitted correctly. In the bottom section, it will list the Date due as 04/15/2016 and the Date received as 04/18/2016. At this time, you may ignore any such notice and the IRS will issue correspondence to correct the erroneous notices. 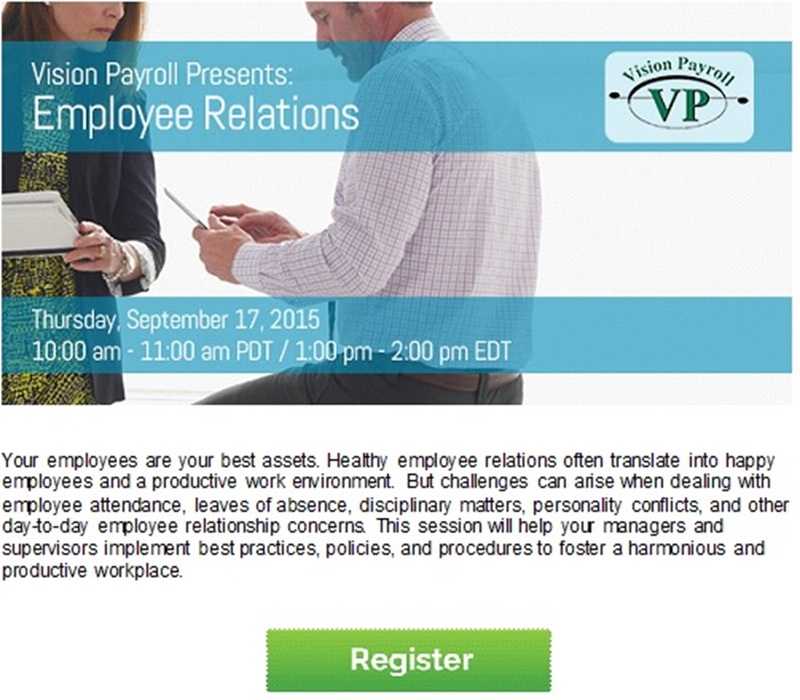 Please contact Vision Payroll if you have any further questions. Trouble Logging In to Run Payroll? If you’re having trouble logging in to run payroll, please clear your cache. Check the Temporary Internet files and website files, Cookies and website data, and History boxes. On the Privacy tab, under Settings, click Sites. Close all open versions of Internet Explorer and reopen to apply updates. In the dialog that appears, select the checkboxes for Cookies and other site and plugin data and Cached images and files. Use the menu at the top to select the amount of data that you want to delete. Select the beginning of time to delete everything. Close all open versions of Google Chrome and reopen to apply updates. An I-9 audit can be an intimidating event. If you haven’t properly completed or maintained your I-9s, it can also be a costly one. 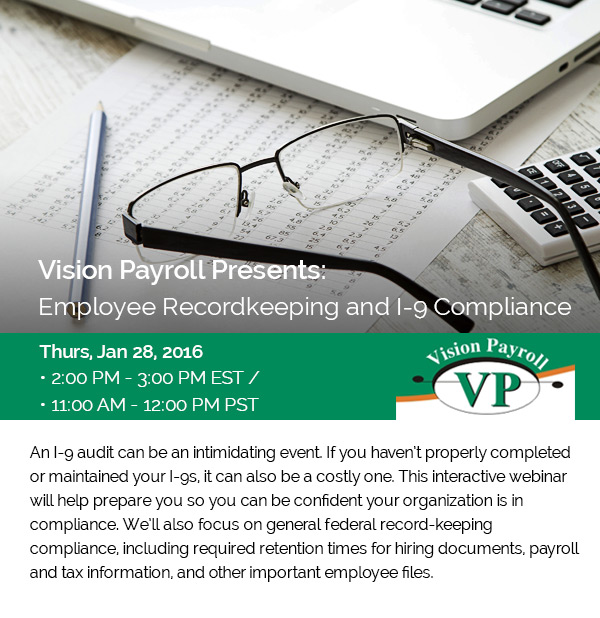 This interactive webinar will help prepare you so you are confident your organization is in compliance. We’ll also focus on general federal record-keeping compliance, including required retention times for hiring documents, payroll and tax information, and other important employee files. Your employees are your best assets. Healthy employee relations often translate into happy employees and a productive work environment. But challenges can arise when dealing with employee attendance, leaves of absence, disciplinary matters, personality conflicts, and other day-to-day employee relationship concerns. This webinar will help your managers and supervisors implement best practices, policies, and procedures to foster a harmonious and productive workplace. The webinar will be held on Thursday, September 17 at 1:00 PM EDT. Click below to register today. The office of Massachusetts Attorney General Maura Healey today published final regulations on the Earned Sick Time law today giving employers seven full business days to implement the regulations. The Earned Sick Time law, Question 4 on the November 2014 ballot, takes effect July 1, 2015. All private employers, including not-for-profit organizations, maintaining an employee with a primary place of work in Massachusetts are required to allow almost all Massachusetts employees to accrue and use up to forty hours of earned sick time per benefit year. Employers who maintain an average of eleven or more employees are required to provide earned paid sick time. All existing sick leave and paid time off policies should be reviewed and many will need to be amended to comply with the new law. As the Massachusetts Earned Sick Time law is complex and penalties for non-compliance can be severe, Vision Payroll strongly recommends employers consult with an attorney specializing in labor law to help ensure compliance with the law and related regulations. 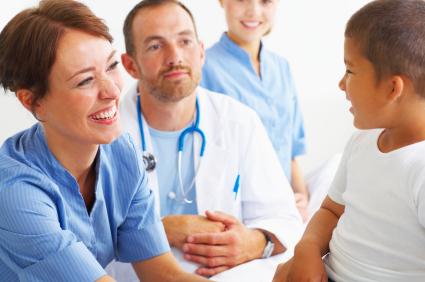 Vision Payroll will be providing a webinar on Friday June 26, 2015 at 11 am to provide further information on the Massachusetts Earned Sick Time law. Although the webinar is free, space is limited and advance registration is required. Click here for further information and to register for this important webinar. scape, including the recent National Labor Relations Board rulings and tips for implementing a social media policy in your organization. Click Here to Register Today for this free webinar on June 18, 2015, from 1:00 PM to 2:00 PM EDT!